Discuss the types of hazards that could affect your family, then create and rehearse an emergency plan for either sheltering at home or evacuating, if that becomes necessary. Know your home’s vulnerability to storm surge, flooding and wind. Front doors and garage doors are the most susceptible to wind. If wind enters a home, the roof can be torn off. Locate a safe room or the safest areas in your home for each hurricane hazard. In certain circumstances, the safest areas may not be your home, but somewhere else in your community. Determine escape routes and a place to meet. The location should be no farther than 10 or 15 miles. Post emergency telephone numbers by your phones and make sure your children know when & how to call 911. Even with tie-down straps, mobile homes can only withstand minimal hurricane winds. Plan to evacuate. Check your insurance policy. Make sure you have enough coverage for your home and personal property. Ask an out-of-state friend to be your "family contact." After a disaster, it's often easier to call long distance. Other family members should call this person and tell them where they are. Everyone must know your contact's phone number. Discuss what to do in an evacuation. Teach children how and when to call 9-1-1 or your local Emergency Medical Services number for emergencies. Show each family member how and when to turn off the water, gas and electricity at the main switches. Teach each family member how to use the fire extinguisher (ABC type) and show them where it's kept. Remain indoors in a safe place - do not go outside. If the eye passes over, it may seem like the storm is gone, but it is not. If you lose power, listen to a battery-operated radio with local news and updates on the storm. Remember, law enforcement and other emergency workers will not respond to calls for service after the winds exceed 45 mph. The danger to rescue personnel is too great. For a Storm Surge Flood Zone map of Citrus County Click Here. 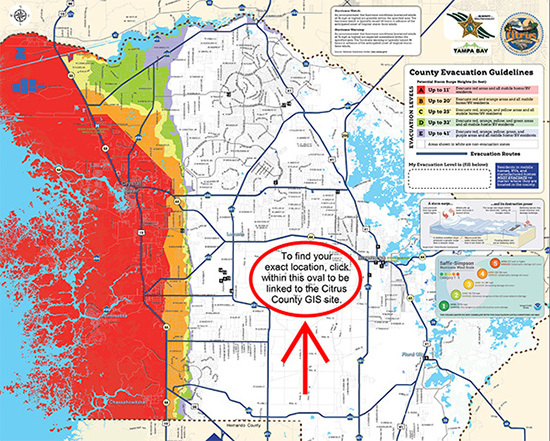 View an Evacuation Zone map of Citrus County. If needed, use your pdf viewer zoom to drill down closer to street level. Shut off water, gas and electricity before leaving, if instructed to do so. Locate the main electric fuse box, water service main and natural gas main. Learn how and when to turn these utilities off. Teach all responsible family members. Keep necessary tools near gas and water shut-off valves. Call your family contact -- do not use the telephone again unless it is a life-threatening emergency. Post a note telling others when you left and where you are going. Listen to your battery-powered radio for news and instructions. Use flashlights -- do not light matches or turn on electrical switches, if you suspect damage. Be careful around your home. Watch out for downed power lines, debris, and other hazards caused by winds and flooding. Be patient. It could take up to 24 hours for county distribution sites to open, or even longer after a catastrophic hurricane. Don’t expect government to deliver supplies - be stocked and ready to support yourself for at least 3 to 5 days. If you are at a shelter or evacuated out of the area, you will not be allowed back in until authorities determine that conditions are safe enough for the public to return. To expedite getting back to your home, obtain a free disaster re-entry tag prior to evacuating. The re-entry pass will be used when an area in the county has been evacuated for any reason. When the area is declared safe for re-entry, law enforcement will be looking for these passes that identify the holder as living in the area. This will speed up the re-entry process, and help deter looters and other people from entering the area. If you don’t have a re-entry pass, you will be stopped at a checkpoint before entering the previously evacuated area, and will need to show photo identification with a listed address in the affected area. The pass should be kept in the glove compartment until needed, and then hung on the rearview mirror of your vehicle during re-entry. 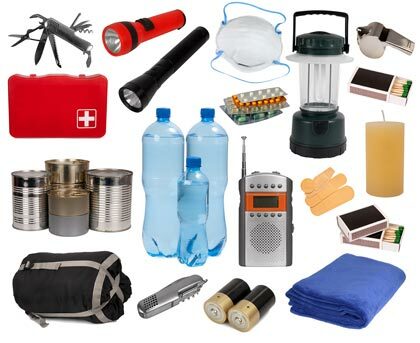 What’s in your disaster supply kit? Water – Have at least 1 gallon per person, per day. Maintain a 5-day supply. Food – Stock at least enough food for 3 days. Keep non-perishable, packaged or canned foods and juices in your kit. Make sure to include food for infants or the elderly, if needed. Snack foods, a manual can opener, cooking tools and fuel will be needed, as well as paper plates and plastic utensils. Bedding – Have enough blankets and pillows for each family member to stay dry and warm. Clothing – Include seasonal/rain gear and sturdy shoes. First-aid Kit – Stock generic medicines, plus a 30-day supply of any needed prescription drugs. Specialty Items – Remember to plan for infants and the elderly, as well as pets if they are staying with you. Toiletries – Include hygiene items, moisture wipes and waterless antibacterial hand soap. Flashlights – Don’t forget fresh batteries! Radio – Have a battery-operated radio and a NOAA weather radio, too. Cash (including small bills) – Banks and ATMs may not be open or available for extended periods after a catastrophic event. Toys, Books and Games – These help pass the time for adults and children! Important Documents – Secure them in a waterproof container or watertight, resealable plastic bag. Include insurance and medical records, bank account numbers, Social Security card, etc. Tools – Keep a set with you during the storm for minor repairs, if needed. Gas Cans – Use them to fill up vehicles if fuel is in short supply, or to run other needed equipment. For more information, visit www.floridadisaster.org.